High heat resistance, cut-resistant, no melting point, low flammability, make TWARON® the best high protection innovative synthetic fiber. PMJ produce its products with ballistic TWARON®, the same used in the production of bulletproof vests, which is difference from all other aramidic knitted, thanks to the shuttle construction with weft/warp woven. The material obtained from these innovative yarns is much more harder than many other, but of course also much more resistant. The resistance is much higher than “Kevlar”, cotton fabrics, knitted fabrics, linings and felt. 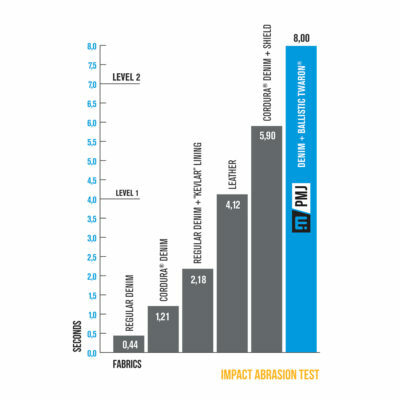 PMJ is the only company that made abrasion resistance and cut tests on aramid fiber. The test is the same used to test clothing for motorcyclists and provides values known throughout the world (EN13595). There’s no other type of fabric that combine strength, practicality and comfort as used by PMJ. The aramid fiber also has a high resistance to heat, decomposes at about 500°C without melting and has an exeptional resistance to abrasion. 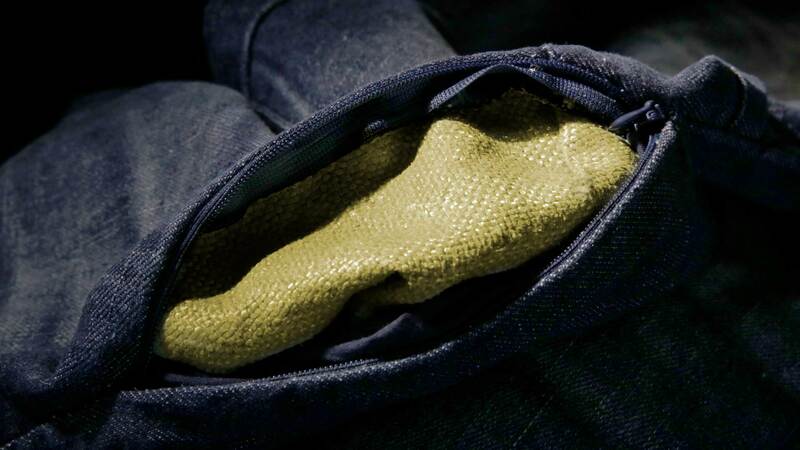 In our products we only use ballistic Twaron®, the same used for production of bulletproof vests, which is difference from all other aramid fabrics knitted, thanks to the woven construction weaving weft and warp. The TWARON® yarn used by PMJ is converted into roll from an italian company, using the best fibers in the world, produced y Tejin Aramid in Japan. Once completed the fabric, this is worked of our purpose and then subjected to various controls and laboratory tests to check its potential for abrasion resistance. The fabric obtained from these innovative yarns is much thicker and denser than most, nut of course also much stronger. The resistance is much higher than fabrics mixed Kevlar/Cotton, woven knitted fabrics, linings and felt. We chosen to reinforce only the greatest risk impact areas, so to maintain a comfortable and breathable product as possibile. All reinforced areas are lined too and the Twaron® is completely invisible and is not in direct contact with body parts. 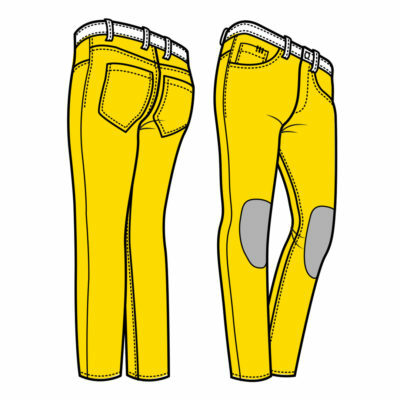 Only 25% of motorcyclists wearing protective trousers that will help to save the legs during a fall. The majority of injuries affecting the lower limbs during a fall, are abrasions and lacerations.